My name is Chance and I want to tell you my story. 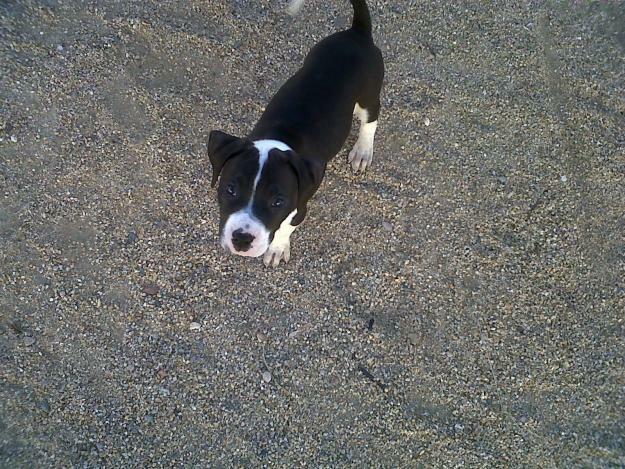 I’m a cute black and white Pit mix puppy. I’m six months old to be exact and I have a great life now! However, two months ago, I was left beside a country road all by myself. I don’t understand what I did to make my owner not want me anymore. I was so scared when they left me, I didn’t know where I was. I’m just a small puppy and didn’t know any better to stay away from the road. I can’t remember when it happened, or how, but I ended up on the side of the road unconscious. When I woke up I was hurting all over. I tried to get up, but my front right leg was broken and it hurt when I tried to breathe. I did my best to crawl over the hole that went under the road to lie down. Some time passed, it felt like forever. I was thirsty and hungry but couldn’t get up to go look for anything. Luckily it rained and there was water in the hole for me. It was in the dark one night that I saw a light coming down the road and I thought I would take a chance. I dragged myself up and started hopping toward the light, but it passed me and went a ways down the road. All of a sudden it stopped and then turned around. The big truck pulled up beside the hole in the road where I was hiding and a man got out. He looked so kind and I couldn’t resist. I went up to him and he scooped me up in his arms and took me to my home where I live now. I have five other friends I live with now, who were dumped like I was. My legs and ribs have healed with surgery and time. Most importantly, I found a new family that will always love me. It is a sad situation to see how some people mistreat their animals. I see it on TV all the time. Dogs being starved, cats being set on fire, horses left to die from lack of food or water. I prayed one night that when I went to heaven that He would let me take care of all the unwanted animals, but He wanted me to do what I could do now. Please help! Don’t dump your animals!! Contact the store at 817.473.1137. We can direct you to animal shelters that will help you find your pet a new family through adoption. This entry was posted on Tuesday, July 24th, 2012 at 9:30 pm	and is filed under Articles. You can follow any responses to this entry through the RSS 2.0 feed. Both comments and pings are currently closed.